OK, Taco Bell -- we get it. You're crazy. We were intrigued by the Doritos Locos Tacos. The Waffle Taco scrambled our brains. But this? 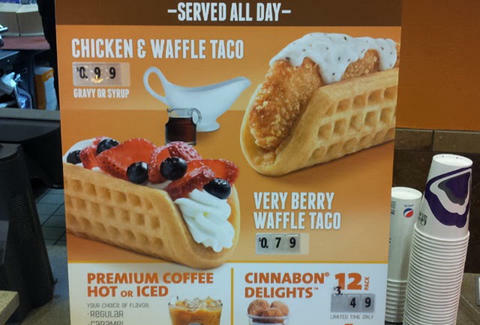 News recently dropped that T-Bell locations in Orange County are testing out two new types of nook-and-crannied tacos: Chicken & Waffle and Very Berry... and dammit, we want them to catch on! Our ravenous correspondents are tracking them down now -- a taste-test and a full photo spread are coming soon. Stay tuned.